The new version of Sheets adds a handful of important new features and improvements, which are supposed to make it easier to create charts or sync files with other apps. 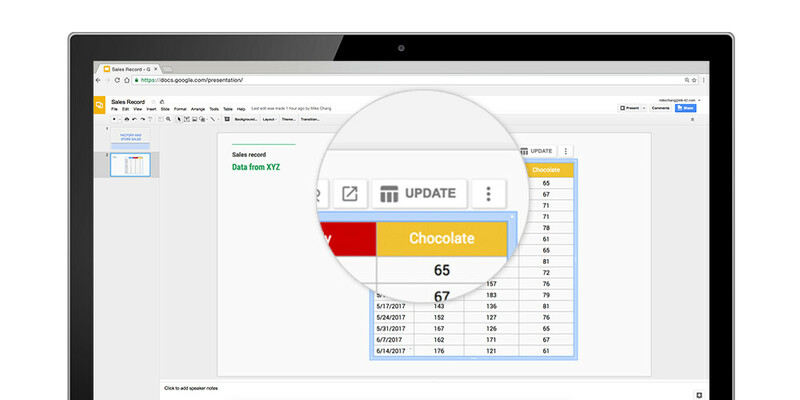 The same machine learning the powers Explore in Sheets now builds charts for users in an instant. It's enough to ask questions using words, not formulas, to analyze the data in the Sheets much quicker. Also, as the title says, the update brings a new option to sync data from Sheets with Docs or Slides. Simply copy and paste the data and tap the “update” button to sync all the data. Other highlights of the update include keyboard shortcuts, improved printing experience, along with a powerful new chart editing experience (available for iPhone and iPads too). A couple of new spreadsheet functions have been added as well, such as “SORTN” (shots the top three orders or best-performing months in a sales record spreadsheet). All the new Sheets features announced by Google will be rolling out to all compatible devices starting today, so make sure to search for the latest version of the app. Microsoft is going to be in real trouble soon. I wish sheets allowed you to access your macros (Add-ons) from their mobile version.